50 ARTISTS. 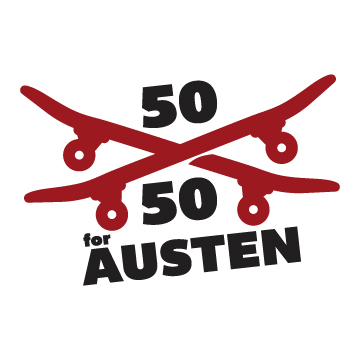 50 SKATEBOARDS. ALL FOR A GREAT CAUSE. This summer, Bruno B. Art Collectif (BBAC) is holding a fundraising event for the Austen Everett Foundation (AEF), a local non-profit organization that empowers kids in their fight against cancer by making them Honorary Team Captain of a pro or college sports team. Seattle team partners include the Seahawks, Mariners, and Sounders as well as teams from the UW and SPU, and there are also team partners in other locations including Portland, the Bay Area, LA, Minnesota, Miami and Maine. For this fundraiser we solicited 50 artists to make art with a skateboard deck, supplied by Bruno B. Art Collectif and donated by Seattle's All Together Skatepark. We will sell these magnificent skateboard artworks at the event, with the goal of raising $10,000 for AEF. 50% of the sales will go to AEF, and the remaining 50% is split —50/50—between the artist and Bruno B. Art Collectif, all of which will be donated as well (thank you participating artists!)! Lagunitas Brewing Company, where this awesome event will be held, will be donating 100% of their profits during the event to AEF too (thank you Lagunitas!). So mark your calendars for Monday, July 29, 2019, 5:30pm-8:30pm and join us at Lagunitas Seattle Tap Room and Beer Sanctuary in Ballard to help us reach our goal. We’ll have live music courtesy of the fabulous The Earthlings (thank you Earthlings!) and hoping to have some skateboard demos, possibly featuring some local athletes. And of course Lagunitas amazing craft beer will be on tap, turning beer into money for the cause! LET US KNOW IF YOU’RE ATTENDING BY CLICKING HERE! THE ARTISTS & the boards!